1) Find a sturdy box. U-Haul sells two sizes of mirror boxes. You can even piece two boxes together to make a custom size. If you are shipping, be sure and check with your shipping company, such as UPS for size restrictions. 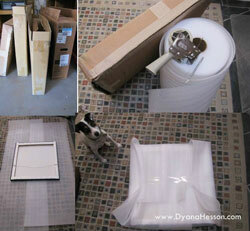 2) Wrap your painting in smooth foam. A good foam can be purchased from ULine. 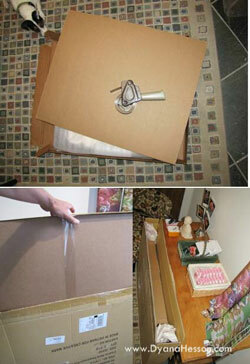 Never use bubble wrap (can indent the canvas) or lint-filled blankets, or paper. The foam will provide the perfect smooth breathable surface you need. 3) Use a good tape to secure the foam. you may want to go around in several directions and reinforce the corners. Use a good tape like Scotch brand, cheap tape will not stick and you’ll need it later for your box. 4) Encase your painting in some scrap cardboard. This will give you some insurance should the box be punctured in shipping. Again, the idea here is to surround your painting in smooth durable rigid material. 5) Slide your encased painting into the mirror box. Ideally you’ll have a few inches around the sides and top. Use crumpled newspaper or craft paper to fill in the empty space. This will keep your painting from wiggling around inside the outer box. The less movement you have, the less chance there will be of damage. 6) Tape up your box. A good tip is to reinforce the bottom and corners with extra tape. This way if your painting arrives at it’s destination and sits in a damp area, the moisture won’t wick up into the box. Hope that was helpful! As always, if you have any questions about anything please contact me at Dyana@DyanaHesson.com.